Mars - God of War. - Roman God. Mars is the God of War and also the guardian of agriculture. Home ¦ Divinity of the Day ¦ Roman Gods and Goddesses ¦ Mars - God of War. Mars - God of War. Mars is the God of War and also the guardian of agriculture. His festivals were held in March and October, which began and ended the season for military campaigning and farming. He was the son of Juno and associated with the Greek God Ares. 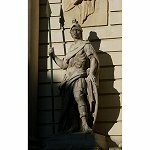 He was popular with the Roman military, he represented military power as a way to secure peace, and was a father of the Roman people. His wife was Nerio ("Valour") who represents the vital force, power and majesty of Mars. As an agricultural guardian, he creats conditions that allow crops to grow, and warding off hostile forces of nature. Mars is depicted as either bearded and mature, or young and clean-shaven, wearing a helmet and carrying a spear. His high priest was the Flamen Martialis and Martius, the month named after him, was originally the first month of the year. October 19: Armilustrium ("purification of arms").